Agnes Banks Nature Reserve, near Richmond, is on the east bank of the Hawkesbury River, on a small area of wind-blown sand dunes, which overlay the alluvial deposits from ancient river systems (up to 65 million years old). This woodland is unique as an anecological community in western Sydney as it includes many species that are more commonly found in both sandstone areas and on coastal sand strips which are some 58km (35miles) away. Depending on drainage conditions, there is great variation within the community, from low woodland on higher ridges to sedge-type vegetation in low lying depressions. Agnes Banks Woodland is well adapted to periodic fires and most species are able to quickly regenerate from lignotubers, buds beneath the bark and seed eleased by fire. 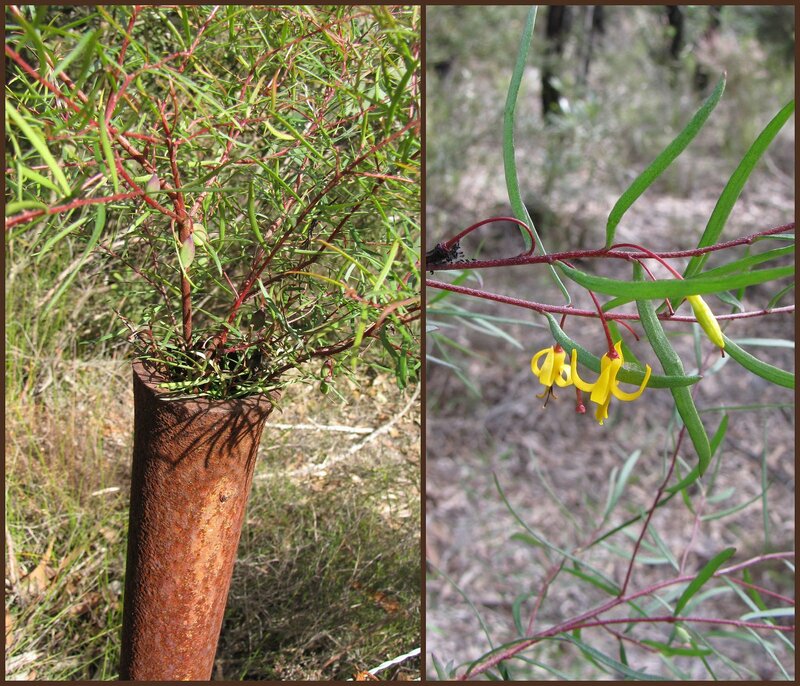 Agnes Banks Woodland includes significant populations of the threatened species, Dillwynia tenuifolia, Acacia bynoeana and Persoonia nutans.Agnes Banks Woodland has been extensively cleared for sand mining. The remaining remnants are threatened with further sand mining and clearing for rural residential development. Yellomundee Regional Park is on the eastern escarpment of the New South Wales Blue Mountains, north-west of Penrith extending from Yarramundi to Mount Riverview and Emu Heights. The Park is very special as it contains large areas of natural bushland as well as sites of cultural and historic significance with important areas of alluvial and riverine plant communities. A storm blew in not long after lunch which forced me to move from Agnes Banks to Yellomundee. Leucopogon virgatus - Common Beard-heath. the red part was the fruiting bodies. A nicely coloured grass type plant. Daviesia ulicifolia - Gorse Bitter Pea. Macrozamia communis - Burrawang (Cycad). I'm sure it's a Boronia sp. , or is it a Zieria sp.? Tree Fern at Yellomundee (Yarramundi). Solanum prinophyllum - Forest Nightshade. Cheilanthes sieberi - Mulga Fern, Narrow Rock Fern. Persoonia nutans - Nodding Geebung. Overlooking Agnes banks from Hawkesbury Lookout. Yellomundee is directly below the cliff-line of the lookout.